Recording a board meeting or other large gathering has never been easier. With only one sleek aluminium hardshell case, you can carry with you everything you need. This professional solution includes two omni‑directional microphones engineered by Olympus for seamless compatibility. The included boundary microphone is purpose-built to clearly record voice at a distance. It automatically cuts extremely high- and low-frequency sounds, improving audio quality and recording usability. The flat conference microphone delivers brilliant sound quality which pick-up sound from a 360 degree radius for a perfect recording experience, accompanied by outstanding ease of use, each microphone has a 6.5 foot cord and cord storage is integrated into the base of the microphone, plus the daisy chain feature of the boundary layer microphone allows the connection of up to 6 microphones to the recording device for larger tables . For maximum coverage, they can be placed up to 4 metres (13ft) apart – perfect for recording in large rooms, concert venues or when many participants are sitting around a very large table. The included DS-3500 top of line digital voice recorder ensures maximum efficiency and productivity. It has a 2” colour TFT LCD with 60,000 colours and white LED backlight. Access to all main commands is cleverly positioned on the unit side to allow intuitive operation via push buttons. You can record up to 66 hours in MP3 Stereo high quality format or 12 hours in a WAV format CD quality. 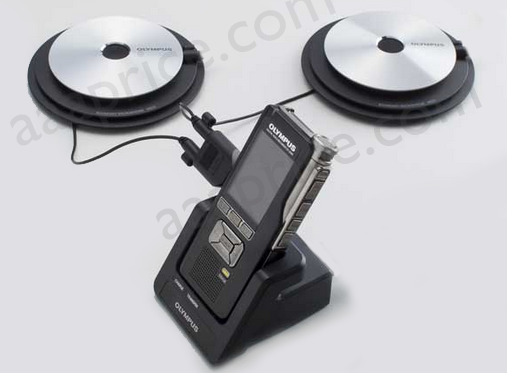 All accessories of the Conference Recording System fit into the included compact metal carry case. This guarantees easy transportation, as well as appropriate storage of your recording equipment. The supplied Olympus Management software allows you to organize, save, edit, combine, divide or rename conference files. Optional Olympus Transcription Kit is the perfect complement for transcription, featuring a footswitch, headset and transcription software. Four playback modes are supported – stereo, mono, left mic and right mic. Recording Features : Editing, Overwrite, Insert recording, Partial erase, Stereo & 2 channel recording. SD Removable Memory: 2GB internal and Upgrade-able up to 32GB.